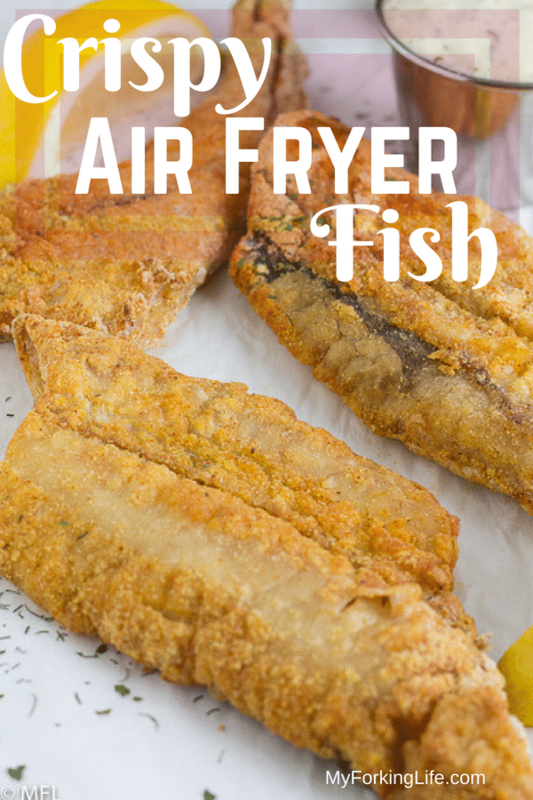 Grab your Air Fryer and make this Crispy Air Fryer Fish ASAP. 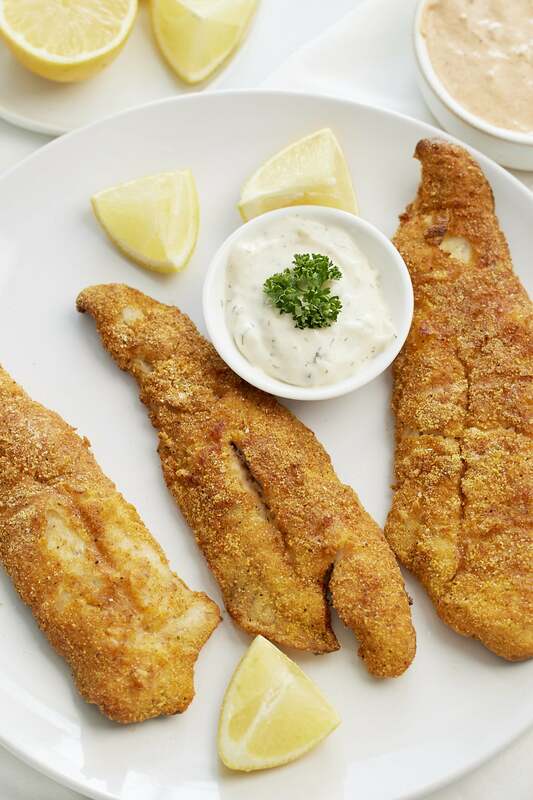 Covered in a crispy delicious crust, you can have guilt free fried fish as often as you like. This post may contain affiliate links, please read my full disclosure here. Summer fish fries are my favorite outings to attend. You know, the ones they have when your uncle who can season the fish like a champ comes over, fries up some amazing white fish, and the whole family gets together and enjoys. I’m talking that fried fish with that amazing golden fried glow. I’m talking that catfish, whiting, perch, yummy! I have those days that I want that amazing fish at home BUT I don’t want to deal with frying in oil. Now thanks to my air fryer, the one I bought on a whim during my pregnancy, I can make delicious golden fish filets whenever I want without all the grease, and guilt. Now I bet a few people are reading in disbelief that I made these golden beauties in my air fryer. How is this air fryer fish so golden? How is it so crispy and flaky? It’s all about the method, which I’ll explain below in the recipe instructions as well as the step by step photos below. 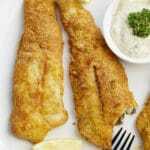 How Do I Air Fry Fish? 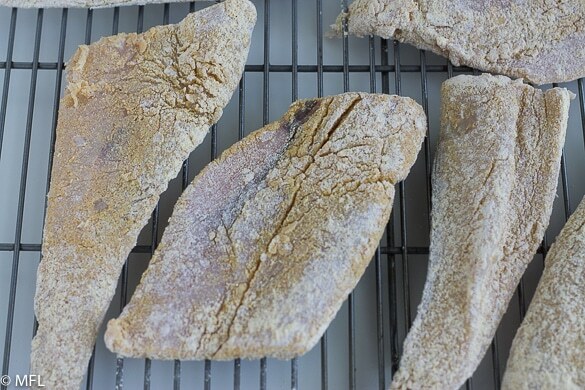 I like to make my own fish breading for this air fried fish recipe as I always have the ingredients and I like to season my fish some more after it’s cooked. I do the salt and pepper after it’s cooked for extra flavor. You can create your own or use the store bought kind, both would work. I’d suggest using fresh fish fillets for this recipe or good quality frozen fillets. If you’re fillets are too thin, they won’t do well in this recipe as they won’t have enough time to crisp well. Spray your oil only halfway through cooking as this will increase crispiness.
. If you really love your over the counter spray and want to use it anyway, remove the fish from the air fryer basket before spraying to make sure it doesn’t land on your basket. 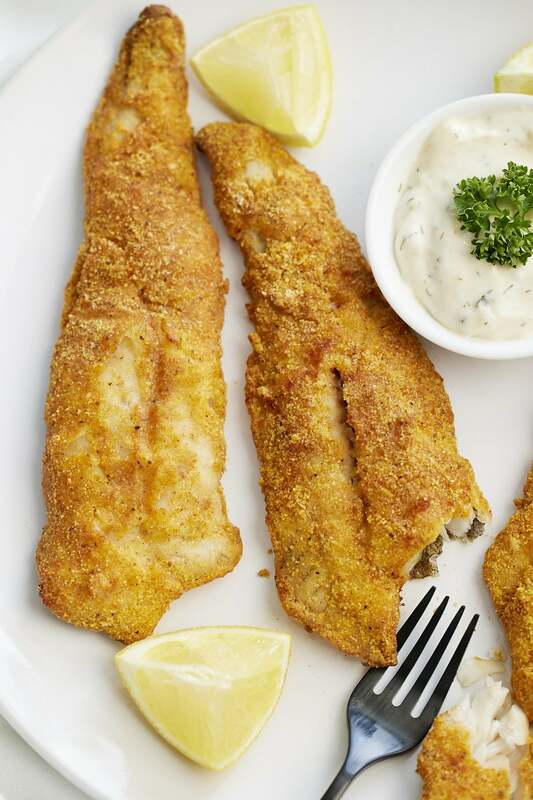 Do not overcrowd your air fryer basket or your fish will steam rather than fry. Make sure when spraying, the fish is fully covered in oil and all seasoning has been fully covered with no flour spots showing. If flour spots are showing, you will not get that good golden color. I use whiteing fish in this recipe however this method will work for any other white fish. 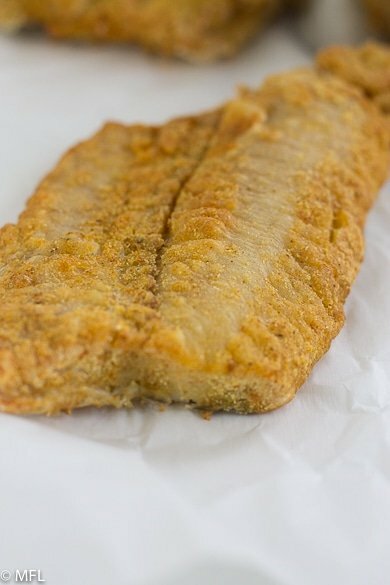 If using catfish, follow my method for soaking in milk first, which can be found on my very first my forking life blog post, Fried Catfish..
Eat fried fish immediatley. All fried foods are better that way. You must have hot sauce. I mean, it’s just a must. If you’re looking for a delicious side to thit Air Fried Fish, try these Air Fryer Potato Wedges. I’m having so much fun with my air fryer that I’m looking forward to sharing more Air frying recipes with you all. Make sure to check out my Marinated Air Fried Salmon, Perfect Air Fryer Steak , Crispy Air Fried Coconut Shrimp, Healthier General Tso’s Chicken in the Air Fryer, Air Fryer Brussel Sprouts, Air Fryer Fried Chicken. 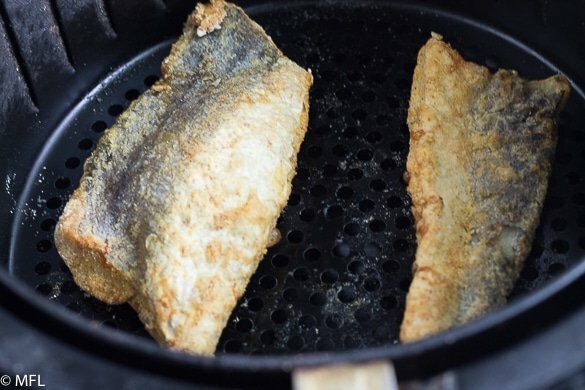 Crispy Air Fryer Fish is golden, crispy, delicious, and healthy. 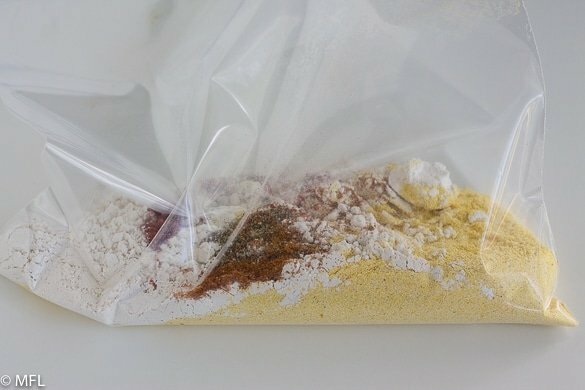 Combine ingredients for fish seasoning in a Ziplock bag and shake. Set to the side. In the alternative, you could use your favorite fish seasoning. 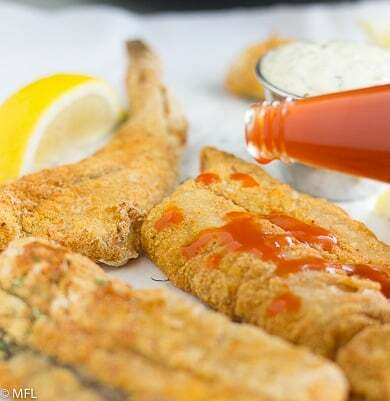 Rinse and pat dry your fish fillets with paper towels. They should still be damp. Place fish fillets in ziplock bag and shake, until fillets are fully covered with seasoning. Place fillets on a baking rack to allow any excess flour to fall off. Grease the bottom of your air fryer basket and place the fillets in the basket. Cook filets on 400 degrees for 10 minutes. Open basket and spray the fish on the side that is facing up before flipping, ensuring that the fish is fully coated. Flip and cook other side for 7 minutes. Remove fish and serve. *Adjust cook times if needed depending on the thickness of the fillet. Combine fish seasoning in a ziplock bag OR use your own favorite brand. Rinse fish fillets dry with paper towel. Make sure they are still damp. Place in ziplock bag and coat with fish seasoning. Shake any excess flour off. Spray bottom of air fryer basket and place filets on top. Cook at 400 for 10 minutes. After 10 minutes, your fillets should look like this. Spray lighlty with olive oil, covering any flour spots and flip fish. Cook for an additional 7 minutes. Remove fish when done and enjoy with tartat sauce, cocktail sauce, hot sauce, or as is. Find more Air Fryer Tips and Trick here. Made the crispy fish for lunch and it turned out wonderful. Just as pictured. Husband said it was better then any restaurant we have eaten at. That’s saying something. Because we are on low carb, I used ground flaxseed for the cornmeal and almond flour for the flour and the taste was just like a regular fish fry. Super recipe. What would have change in the recipe for air frying Smelt. Or can’t it be air fried this way. Hi Robert, I’ve never tried Air Frying Smelt but now you’ve got me thinking, lol. I’d probably decrease the cook time a bit since it’s a smaller fish. Love the breading. Light but crusty and flavorful. I recommend this. 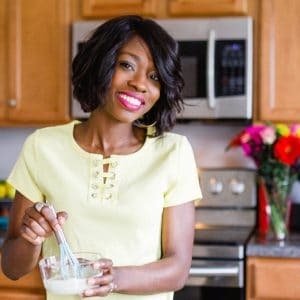 I love your recipes but I have one question to you or anyone out there. I am nervous about frying fish in my air fryer. I am afraid that it will leave a fishy smell in my air fryer. Can someone please tell me if this is true or not? Any help will be greatly appreciated. Hi Ronald, Thanks so much for the comment. As far as the smell, my Air Fryer doesn’t smell like fish after air frying in it. 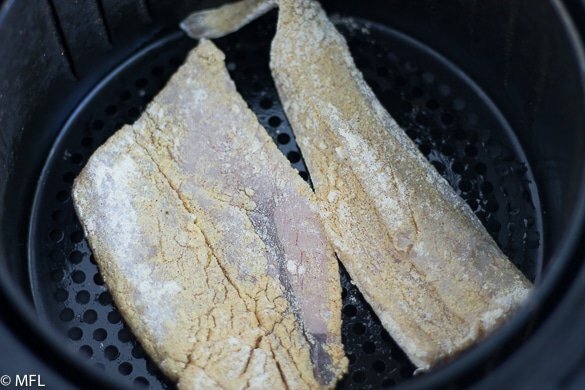 It’s another advantage of using the Air Fryer for frying fish. I have done Cod and shrimp. First off, I am pleased to tell you the house did NOT smell like a fish processing plant. I’m going to try this tonight I hope it works.i never made that before..it looks good.